running from 12-8pm Friday 21 to Sunday 23 November (6pm finish Sunday). This will be a rare opportunity to sample and buy these goods, which are not commercially imported. 3 more days of cultural events follow, details of which will be posted as the arrangements are finalised. Go to EVENTS to see the story unfold. As well as outlining some of the issues facing this first Terra Madre campaign in the UK, it relates work already underway, support materials available to convivia and details a fund-raising raffle with some enticing prizes. 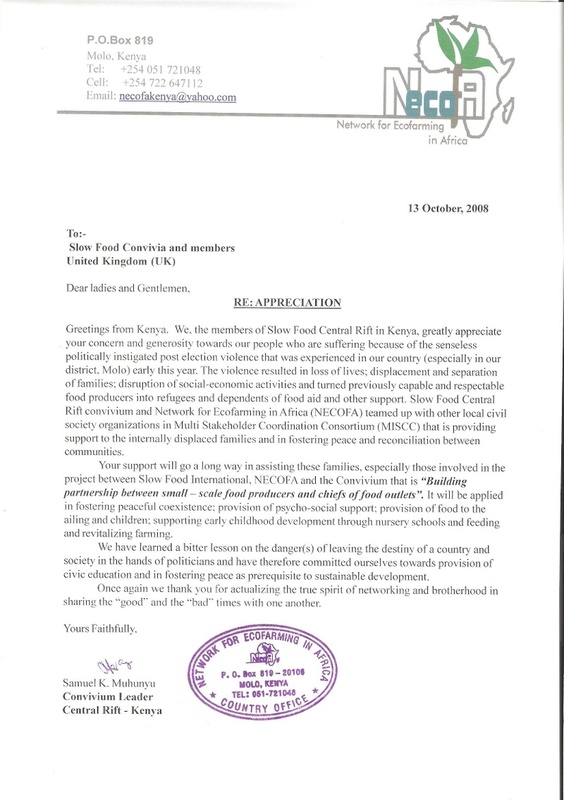 Slow Food UK have received the following letter of appreciation from Slow Food Central Rift Valley in Kenya, expressing their appreciation of the funds raised by UK convivia, including London's £1275. Many thanks to everybody who helped to make this happen.